PYEONGCHANG, South Korea (AP) — Chloe Kim stamped her name on a new era of snowboarding with a run down the halfpipe that, officially, did not mean anything, but to her, meant everything. The Olympic gold medal was already hers but she knew she could do better. So, she cinched on her gloves, cranked up "Motorsport" on her iPod, said "This one's for you Grams" — a shout-out to her South Korean grandmother, who was watching her in person for the first time — and dropped into the halfpipe to make history. On the last run of Tuesday's sunsplashed final, Kim hit back-to-back 1080-degree spins on her second and third jumps — repeating a combination no other woman has ever done in a competition. She landed them squarely, sent her already super-hyped family at the bottom into overdrive and sent out the message that everyone from grandma to those at the roots of this sport love to hear: "I knew I wasn't going to be completely satisfied taking home the gold, but knowing that I could've done better." The 17-year-old from California made it look easy, but only afterward did she concede how difficult the past several months have been. 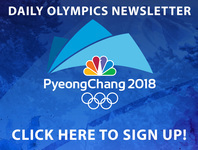 Her story has been told and sold and marketed for gold: Her parents both emigrated to the United States from South Korea, and though it was more coincidence than any grand plan, Kim making her Olympic debut in the country where her family was from set up a sure path to stardom in the halfpipe and beyond. She has commanded the progression in women's snowboarding for at least two years now, and it was hard to imagine anyone beating her on the sport's biggest stage, at her official coming-out party. But halfpipes are hard, the snow is frozen and nothing is for sure. "There is a lot of pressure revolving around these games," she said. "You wait for four years to come here and it's definitely a lot of hype around a 1 1/2, 2-hour time period. It's pretty nerve-wracking. You know you're at the Olympics. It's been a dream of mine since I was a little girl, to land a run that's very important for me." She didn't have to do it. In the first of the day's three runs, she flew higher than anyone on her opening straight air, then landed one 1080, and closed with a pair of inverted spins, each with well-timed, easy-to-see grabs of the board that the judges appreciate. Her score there was a 93.75, which put her nearly nine points clear of the other 11 riders, none of whom would crack 90. The rest of the day was a contest for second, and China's Liu Jiayu won it. She said injuries made her reboot and reconnect with her love of the sport, regardless of the result. It will be interesting to see how the 25-year-old's attitude shifts four years hence, at the Winter Olympics in Beijing. Third place went to another young American: 21-year-old Arielle Gold, who casually announced afterward that she had separated her shoulder here on the second day of training, much the way she did on a training run in Sochi four years ago that forced her to scratch from the competition. "The doctors (say) that the more that it happens, the less impactful it is," Gold said. That bronze-medal run pushed Kelly Clark — she of the one gold and two Olympic bronzes — into fourth. This was Clark's fifth Olympics, and the 34-year-old left the halfpipe with her own future to consider, but knowing the future of the sport she helped bring to the masses is in very good hands. "Chloe's an outstanding snowboarder, but I'm more proud of her for how she's handled herself as a person," Clark said. "She's handled success and pressure with grace and class, and it's refreshing." Kim's journey included two years in Switzerland, where she lived with her aunt, learned French and honed her snowboarding skills. Her father, Jong Jin, gave up his job to chase his daughter's dream. Down in the fans section, where Jong Jin was joined by his wife, Boran, along with Chloe's two sisters, three aunts, two cousins, and her 75-year-old grandma, dad pointed to himself and said "American dream," then let out a big whoop. "I did, like, a 12-year sacrifice, and finally I got my reward," he said. "Thank you very much (to) my daughter." She put on quite a show, and she will be rewarded in ways large and small. Heck, her Instagram following nearly doubled, to 350,000, since she arrived in South Korea — and that was before she won the gold. But deep down, she knows where the real thanks belonged. Her way of giving it was the classic run she put down at the end. "To just quit work and travel with your kid full-time, leaving your wife behind and really chasing this dream because your kid is really passionate about this sport, I'm always so thankful for that," she said. "And today, I really did it for my family and everything they've done for me." AP Sports Writer Jake Seiner contributed to this report.